Project C.U.R.E. is a medical humanitarian relief organization that collects donated medical supplies and equipment to send to hospitals and clinics in over 130 countries. They have local partners and visit each site to evaluate their needs and plan shipments of donations. The goal is to give local health workers and facilities the supplies and tools they need to improve medical care delivery in their communities – we want to strengthen and empower the systems that are already in place. What will I be doing if I volunteer in the warehouse? Why is this a part of HOMES Clinic? HOMES clinic’s mission is to provide care for the underserved locally through clinic and outreach. Project CURE shares this mission of caring for the underserved on a global scale through work done locally. HOMES clinic brings together a multidisciplinary volunteer force, united by these common goals, to learn more about each other through service. We believe that our work at Project CURE complements that, and we wanted to provide more opportunities to work together with our colleagues from other institutions and professions. Why should I volunteer? What will I gain? Look for posts in HOMES clinic fb page, global health interest groups, and emails through the HOMES listserv. You can also email the HOMES-Project C.U.R.E. Liaison, Alyssa Thomason at Alyssa.thomason@bcm.edu for more information, questions, or to be added to a Project CURE email list for occasional emails for upcoming events. How do I prepare for a day of volunteering? Dress in comfortable, weather-appropriate clothes: the offices and sort area of the warehouse have air conditioning, but the remainder of the large warehouse is not climate controlled. Start by volunteering in the warehouse and learning what the organization is all about. You can volunteer during HOMES clinic days (quarterly), independently on your own schedule, or organize your own groups to bring to volunteer! See projectcure.org/volunteer/location/6 for more information. Run a Kits for Kids Drive - Looking for a fun, easy to set up service drive for your organization? Kits for Kids programs collect first aid supplies to package in kits for delivery to local families, putting tools for healthy lives not just in the clinics, but in peoples’ homes. Go to projectcure.org/programs/kits-kids for more info. 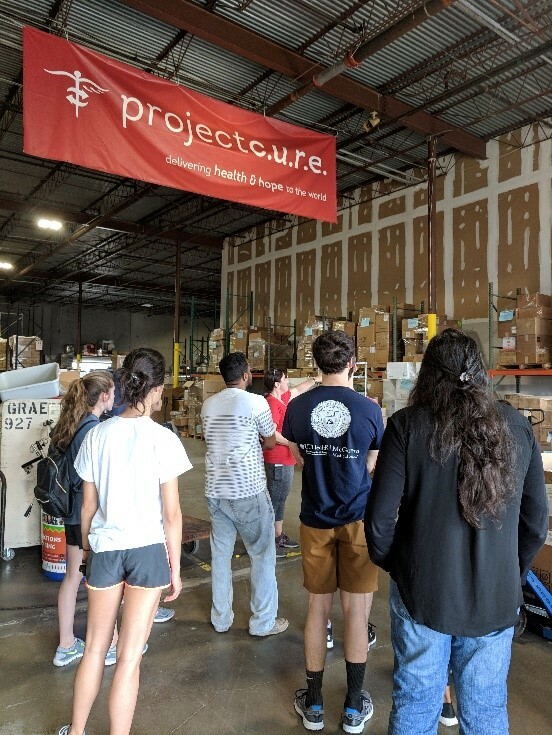 Work on a special interest project - If you frequently volunteer and have a specific interest or skill set, there are ways to focus on it in the warehouse, or by developing a personalized project in the warehouse, through advocacy or fundraising, or something new and creative! 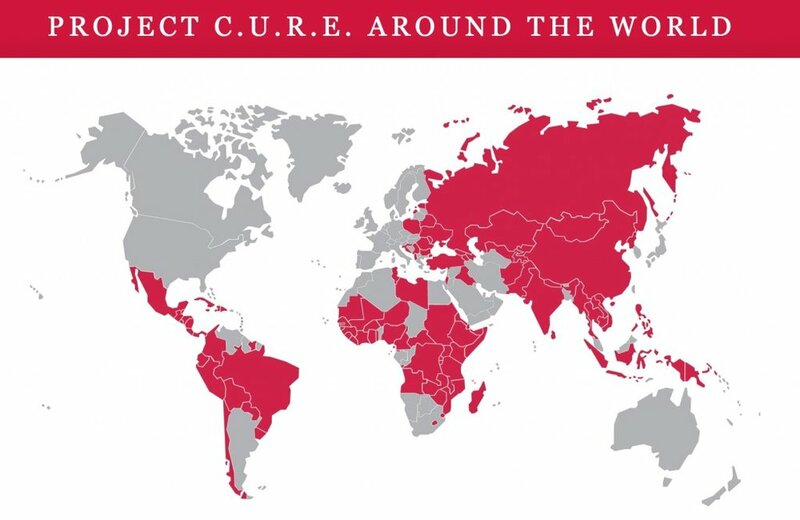 Volunteer abroad on a CURE Clinics trip, brief global mission trips where Project CURE promotes local health care systems and puts on health screening clinics in local communities. This is a great way to get introduced to global aid work in a schedule achievable on a student schedule. For more info, visit projectcure.org/cureclinics, and feel free to contact Alyssa Thomason at alyssa.thomason@bcm.edu.